Does this look familiar? Many of us have accumulated a lot of kitchen tools over the years and they’re often jumbled in drawers, so we’re not sure what we have or even how much we like them. Any decent mechanic will tell you that a few highly functional, top-notch hand tools beats the pants off a garageful of gear that’s either badly designed, cheaply made, or so rarely used that it does little more than take up space. This philosophy holds true for the culinary toolbox: despite the fact that Americans pack their cabinets, drawers, pantries, closets, racks and bins with strata of gadgetry so dense that, even if quality tools were present, a team of archeologists would be required to extract them. This kind of contraptional constipation can produce but one end: a bulky, inefficient, fat kitchen. The good news is that this condition is treatable. The bad news is that surgery is required. The stricken cook must submit his or her kitchen to a thorough and disciplined debulking, removing without fear or remorse all items that don’t pass muster. What muster? Keep reading. 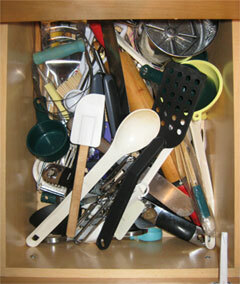 Clear one large drawer, a cabinet or shelf, and a portion of your pot rack if you have one. (Editorial note: use a storage tub if you need to.) If you don’t have a proper storage system for your knives, get one. Then every time you use a tool (including pots and pans, all hand tools, and knives) put it away in one of those cleared areas. If you run out of room, make more but under no circumstances allow the used and the unused to mingle. Live and cook like this for sixty days. Do I have another tool that could do your job as well, if not better? Are you well constructed and designed for the job for which you are intended? If the answer is yes, the item stays; if it’s no, you dump the rubbish and go shopping for something better. Although you don’t have to buy the shiniest, latest version of every cooking tool (in fact, I recommend that you don’t). Your gear should be designed to best perform the tasks that will be required of them for as long as you think you’ll need them. In this light, spending a hundred bucks or more on a chef’s knife is not unreasonable. Nor is spending a few minutes to thoughtfully evaluate something as inexpensive and mundane as a vegetable peeler. While you may not want to go through this entire process, it's a good way to look at both the tools you own, and those you want to buy. That's basically what we did when we chose the Cool Tools to include in Colbrook Kitchen.